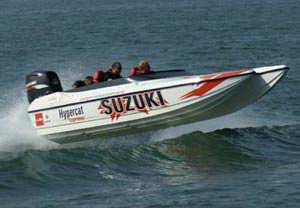 This RIB powerboat experience in Southampton lets you see the south coast from the sea, as you blast your way around the Solent in a powerful Rigid Inflatable Boat! This is a marvellously exhilarating experience; feel the wind in your hair and the sea-spray on your face as you bounce along the water's surface at serious speeds! The RIB experience begins at the Ocean Village Marina, where you will meet the crew and have a full safety briefing and life jacket fitting, and you'll be instructed on how to sit safely in the RIB. After this, it's time to head to the pontoon, climb aboard the powerboat with the rest of the group, and get ready for the ride of your life! 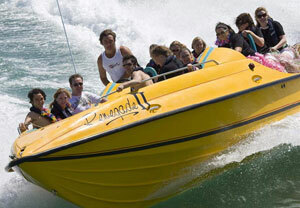 Your powerboat captain will take you out into the water. As you leave Ocean Village and hit open waters, you'll start to get a great view of the coast. 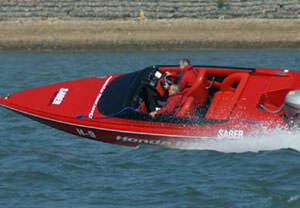 Things get taken up a notch once you turn towards the Solent, as you pick up some speed and start to bounce across the swell, or jump the wakes left by the Red Jet Cats that will be out on the water with you. Your experienced captain will put the powerboat through its paces, showing you just what these RIBs are made of as they handle some tight turns, thrilling jumps and exciting wake rides.This 60 minute RIB ride in Southampton is a fantastic way to get an idea of what these beautiful boats can do in the hands of a pro, and it's a superb experience gift for thrill seekers in Southampton!